GORDONVILLE – The dogs on Main Street are howling. Hungry hearts are starving. It’s getting harder to be saint in the city. Glory days are getting a little gory these days. Bruce Springsteen is under attack for his alleged offensive song choices during the Veterans Day “Concert For Valor” in Washington, D.C. Tuesday. But don’t go hiding on the backstreets just yet. No need to feel like rider on a downbound train. There is a lot of light on this right now, but no need to be blinded by it. It is not something new for Springsteen, as a proud disciple of the Woody Guthrie lineage of singer-songwriters speaking for the people not the ones who take their voices away, to be under fire. If you are a power lifter when it comes to having strength in your convictions, you can weather these storms on your own. Springsteen did this years back when his song “American Skin (41 Shots)” was first performed in concert in 2000 – later to appear on a 2001 live album (“Live In New York City”) and eventually a studio release – and the subject matter, the 1999 shooting of an unarmed African immigrant under unclear circumstances, irked the law enforcement community to the point that a boycott of concerts was urged. His first dalliance with national controversy was in 1984, when the song “Born in the U.S.A.” – from the album of the same name – was taking the country by storm. Misunderstood – or misinformed by his advisers – Ronald Reagan heralded the song that is more of a rant than an anthem. Inspired by his friendship with Ron Kovic (the real-life character of the 1989 “Born on the Fourth of July” film starring Tom Cruise, Springsteen wrote “Born in the U.S.A.” about how a large number of veterans of the Vietnam War were scattered to the wind and forgotten. He hadn’t forgotten them, though. Another song that didn’t make that album, “Shut Out The Light,” further illuminated Springsteen’s empathy – and some modicum of guilt for being from that generation but having not served (he failed his draft physical because a recently broken leg from a motorcycle accident had yet to heal) – on the topic that had been swept under the rug in terms of national dialogue. He not only called attention an issue no longer chic for the anti-war protestors who had gone on to cut their hair and become cocaine-snorting yuppies. He put his money where his mouth was by donating time and money to the cause without fanfare and photo opportunities. When he hit the stage Tuesday, I kind of cringed to see him come out alone with just an acoustic guitar and a neck harmonica holder. After Metallica had just rocked the house down, an acoustic Springsteen set was not going to bode well. I admit, even as a devotee who rarely criticizes the only person I called Boss (aside from the wife), what followed was not a career highlight. I don’t say this because of the three songs he did – “The Promised Land” and then “Born in the U.S.A.” and “Dancing in the Dark” – but the way he played them. If he was going to go it alone, without the E Street Band in tow, at least have another picker or two – Nils Lofgren, Steven Van Zandt, Tom Morello or just someone from a band already there – and play the acoustic versions a little more straightforward and hard-driving to engage a crowd that was too large for a coffee house approach. And that was it, in terms of criticism. The song selections, in and of themselves, were fine. “The Promised Land” is more of a social statement than it is overtly political, while “Dancing in the Dark” was a just pure pop song. As for “Born in the U.S.A.,” causing conservatives to go apoplectic, it was more of the aforementioned style in which it was played to a crowd looking more to cut loose and pump fists that was a cause for pause. As Springsteen said when he introduced it, “Born in the U.S.A. remains as relevant today (after the Vietnam-like quagmires in Iraq and Afghanistan, followed by inconsistent treatment of returning veterans) as it was when it first came onto the landscape and confused Ronald Reagan. That is the real shame, and not addressed that self-evident truth is nothing more than a diversionary tactic by the right. The sobering statistics on suicide for veterans — estimated at more than 20 per day — solemnly speak for themselves. Having seen enough, I turned off the television after the three songs. My wife was at a late meeting and Sofia hadn’t started her homework. It dawned on me that Springsteen might come back out and join in some jam session later in the show but, honestly, I didn’t really care that much. With the invention of DVR, and On Demand, I knew I could dial it up again. Turns out, what I missed was Springsteen and Dave Grohl joining the Zac Brown Band for a rendition of the Creedence Clearwater Revival classic “Fortunate Son,” which stood out from a litany of anti-war songs from the Vietnam era in that it came from the perspective of the pool of largely poor kids being sent to fight in a rich man’s war of folly. Apparently — with those in the crowd, the ones for whom the concert was taking place — it struck a chord and went over well. With the naysayers on the right, who probably think anything less than “God Bless America” in a post-9/11 world is strategically deemed an act of treason and the performer labeled a heretic to be blacklisted like in the McCarthy era. I was hit with the news on social media the next day, and disgusted by the right-wing’s righteous indignation. The good news amid the bad was that most of the venom was directed Springsteen, the biggest name, not Brown or Grohl. The other guys may react with less tact, and make a bad situation worse. But this is par for Bruce’s course since getting in touch with his inner Bob Dylan after more of a John Steinbeck approach in his coming-of-age run from 1975-1980. He’s been there, done that. It’s not that he is looking for trouble – if he were, there were other songs from his catalogue that could have really made the heavens heavy in Brill Cream – but he isn’t running from it, either. 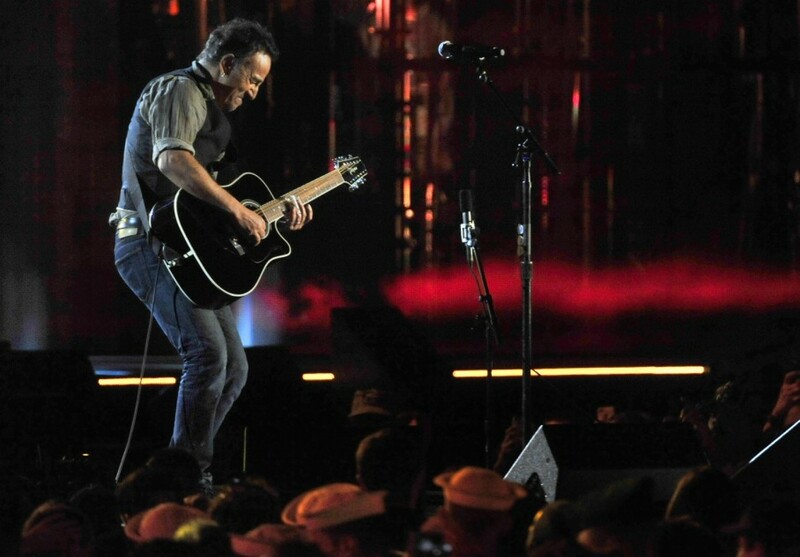 Just since 9/11, the date where those who decry political correctness set strict boundaries when comes to wartime etiquette – we must thank soldiers for their service to our country but repeatedly support policies that do them and their families a disservice – Springsteen has, and will continue to, write songs to expose those bitter ironies. Not a popular sentiment back then, but he was seeing through the smoke and mirrors. He was a step ahead of the curve about what he termed the “seeds of betrayal” about the selling of the Iraqi War were self-evident. He went on the stump for John Kerry in 2004 and for Barack Obama in 2008. The title track of his “Devils & Dust” release in 2005 was written from the perspective of a front-line soldier in Iraq. He continued decrying the injustice of war with no draft – making it a silent class war (the point of the song “Fortunate Son”) by definition – on “Magic” in 2007. The economy ravaged by George W. Bush going to war but no raising taxes, something unheard of in modern history, was illuminated in the song “Long Walk Home” and remained a theme up through current releases. If Springsteen really want to be controversial, he could have played any of these songs instead. If the wrong-wing pundits knew this – which would mean they knew what they were talking about before letting actual words fall from their tongues – they wouldn’t look quite as idiotic as they did Wednesday morning. But we have the option to rise above. We were born in the U.S.A., making us fortunate sons. This entry was posted in Music, Politics on November 15, 2014 by gordonglantz.